CANADIAN DEFENCE MATTERS: WHAT COST STEALTH? Writing in the Air Force Research Institute’s Air & Space Power Journal, Lt. Col. Christopher Niemi, a former F-22 test pilot who later commanded a frontline squadron of the radar-evading jets, makes the case that the U.S. Air Force is making an historic mistake by buying only stealth fighters, that is the F-22 and the newer F-35. His history and analysis of the F-22 acquisition is well worth reading in its entirety. His conclusions are directly applicable to the Canadian situation. “Although stealth is a powerful enabler for offensive systems, its greatest advantage lies in its ability to dramatically increase aircraft survivability against radar-dependent threats. Consequently, stealth’s utility depends on the presence of those threats. 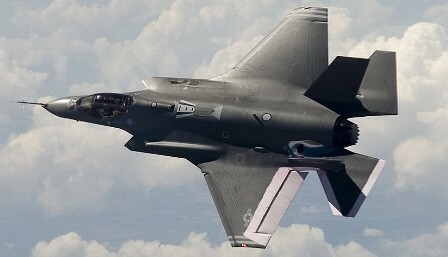 By insisting on acquiring only stealth fighters (regardless of the cost), the Air Force assumes that future adversaries will not counter stealth technology and ignores the fact that many air combat operations continue to occur in low-threat environments. For example, allied fourth-generation fighters operated freely over large portions of Iraq (both in 1991 and 2003), Serbia, and Libya from the beginning of those conflicts. Future hostilities likely will continue this long-standing historical trend, and currently fielded stealth assets can mitigate risk to operations in high threat environments where fourth-generation fighters are most vulnerable. Of note is that this analysis would be just as accurate and insightful if all references to the U.S. service were replaced by the initials RCAF. In his paper Lt. Col. Niemi contrasts the U.S. Air Force’s experience with that of the U.S. Navy. Rather then build a single purpose aircraft designed for a specific scenario, the Navy simply modified the design they had, the F-18 Hornet, to deal with perceived problems. Range and the ability to land with unexpended ordinance were the main issues that were successfully addressed. The Navy has ended up with an aircraft fleet with a lower average age (by a factor of decades) then the Air Force and has left themselves in a better position to deal with any failures (financial or technical) that may arise with the F-35 program. Rather then follow the flawed planning of the U.S Air Force the RCAF would do better to emulate the U.S. Navy strategy. Canadian Defence Matters has long advocated a mixed buy of F-18 Super Hornets along with a smaller force of F-35’s. Lt Col. Niemi's paper reinforces this opinion with informed and timely analysis.